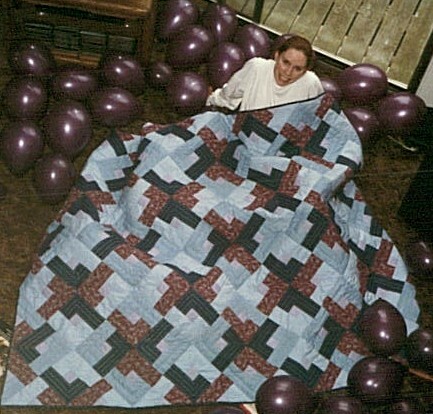 This is me with the first quilt I ever made, soon after I finished it in January of 1989 (it is also soon after I finished making payments on my first car, which is why there are so many balloons around, but that’s a story for another entry). It started when I ran out of magazines to read during lunch–the quilting titles were shelved near the periodicals I usually bought and one day when I’d read all the current issues of my usual choices, I picked up a couple of the colorful quilting ones. I planned only to look at the pretty pictures, but after pondering the question for a few months in the back of my head, I figured there was no reason I couldn’t actually make a quilt myself. I went to a fabric store (I didn’t know such a thing as quilt stores existed) and bought small amounts of fabric to take home and choose the final five called for in the pattern I’d chosen (not the one on the cover that had attracted me to the magazine, and not the one I’d filled a sheet of graph paper playing with color combinations for, but one that seemed simple). I picked fabrics that were the kind I associated with quilts, which meant mostly small florals. I felt very daring for choosing one stripe, though that too had small flowers on it. I made my picks and went back to the store to buy the yardage required. I believe this is last time I ever did that–bought fabric in specific amounts for a specific quilt. I’d already decided not to do the border called for in the pattern; I don’t remember why–maybe because it didn’t really add anything to the design, but probably because it seemed like a lot more work. The pattern was twin size, so that’s what I made, even though we didn’t have a twin bed (still don’t; the quilt now lives on our queen-sized guest bed, where it covers only the part of the bed below the pillows). I made templates out of light cardboard, traced around them to mark each piece individually, and cut the patches individually with a scissors. I hadn’t heard of rotary cutters yet. I sewed the blocks together without too much trouble–by machine, because that’s how I learned to sew from my mom. It never occurred to me to do it by hand. The only problem I ran into was in pressing them–the lavender solid was 65% polyester and some of the pieces melted and deformed when I ran the cotton-hot iron over them. Lesson learned. I haven’t stopped using blends entirely, but I’m more careful around them with the iron now. When I’d finished several blocks, I laid them out on the living room floor and ran up to the bedroom to see what they looked like next to each other (the apartment we lived in then had a cathedral ceiling in the main room and a half wall in the bedroom above). Felt wall? I had no idea what that was, but this method for viewing my work from a distance worked fine. Once it became clear that I was going to finish the top, I returned to the fabric store and bought six yards of light blue solid for the back, but once I realized I had just enough to make the back out of the navy stripe, I did that instead. Only later did I learn about “proper” three-piece linings (why the back of a quilt is sometimes called the lining I’m still not clear on, nor have I to this day followed the three-piece rule). I’d seen a quilting frame in a magazine that seemed inexpensive as well as easy to disassemble and store and looked in the yellow pages for a store where I could buy on. That led me to the first quilt store I ever went to, where I bought not only the frame but the batting recommended by the lady working there. I quilted by hand–why it didn’t occur to me to try doing it on the machine, I’m not sure, other than everything I knew about quilting, which was not much as should be clear by now, said they were quilted by hand. 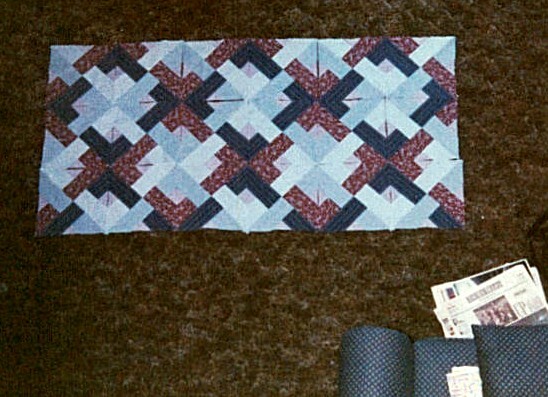 I devised my own quilting pattern and executed it in two shades of blue thread. The frame sat in our living room for months. 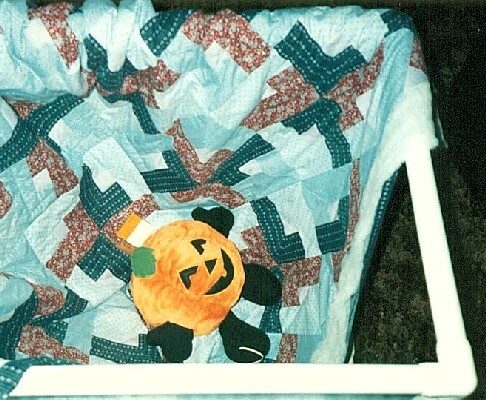 Mr. Karen thought it looked like a little trampoline, and one day Mr. Pumpkin came hurtling down on it from the bedroom. As I went along, I learned about things like popping knots at the start and end of threads. When I was done quilting, I bound it by bringing the back around to the front, because that seemed easiest. I decided to call it “Secret Arborland”, because the pattern was called “Secret Arbor” and I’d bought the fabric at Arborland Mall. I didn’t start my second quilt right away, but I did start my fabric collection. By the time we moved out of that apartment a couple years later, I had probably a half dozen boxes of fabric in our storage closet. Now I have a whole closet full. One year ago, I gave myself a report card. Two years ago? Skiing, not writing.